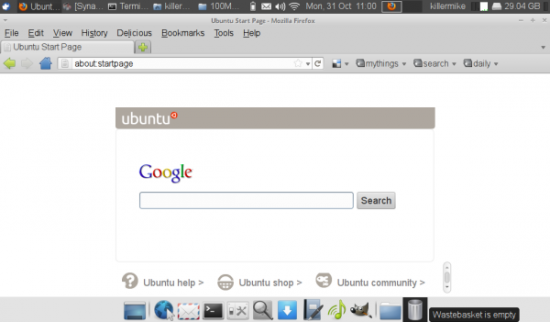 October saw the release of the latest version of the Ubuntu family and that includes Xubuntu, the Xfce edition. 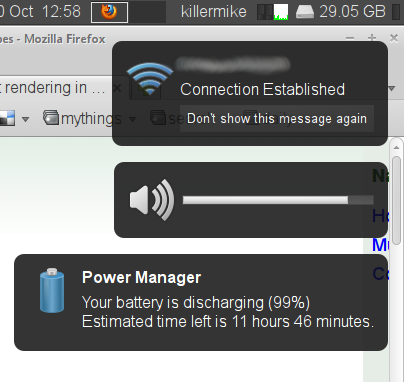 I’ve just installed Xubuntu 11.10 on my netbook and the experience was rather good. The netbook in question is an eMachines (Acer) model eM350. The specs are: 1.6GHz Atom processor, 1GB of memory and a 160GB hard drive. I'd been using it for a couple of months with the default installation of Windows XP. In this case, I installed Xubuntu by downloading the ISO as usual and using Unetbootlin to copy it to a flashdrive. With each release, Xfce becomes more and more comprehensive. Xubuntu 11.10 uses Xfce 4.8 (covered here), and overall, the dark default Xubuntu theme looks attractive. As I've speculated in the past, I think that Xfce is going to become home to more and more users who want something that is under active development, yet looks and works like a Gnome 2, KDE 3 or even Windows XP desktop. In its default configuration, the task switcher, application launcher menu and status area are located on a bar at the top of screen. Moving the pointer to the bottom of the screen causes an icon-based application bar to appear, an efficient use of space on a netbook display as it retracts when not in use. A layout that strikes a good balance between a traditional desktop and a space-constrained one. As good as things looked initially, I began to notice a problem on the visual front: the font rendering looked rather blurry. Fortunately, a Google search turned up this neat little hack. Creating the two configuration files, as directed, altered the way that anti-aliasing is applied to fonts, giving them a crisp, smooth, if slightly heavy appearance. The default setup of the font rendering was so poor, that I honestly don't think I could have used it in that condition on a long term basis. Without the fix, text also had a misty quality when I installed Xubuntu within a VM on a desktop machine. I couldn't detect the same problem when I installed Ubuntu 11.10. Xubuntu 11.10 installed in VirtualBox. 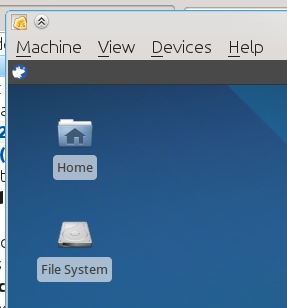 Notice the misty quality of the Xubuntu text compared with the Kubuntu native rendering. As I said before, the hardware support has been excellent, right out of the box. The sound, the graphics and the wireless and wired networking adapters worked without a hitch. Funnily enough, I hadn't been able to get this Broadcom wireless adapter to work on Puppy Linux. Suspending to RAM and hibernating to the hard disk both worked as expected. There's been a lot of talk recently about kernel bugs having a negative effect on battery life. I didn't do any exhaustive testing but power management features such as shutting down the fan and dimming/blanking the screen worked fine and battery life seemed roughly as expected. I might have got lucky, or perhaps a longer testing period would have revealed a deficiency in this area. When the machine starts up or resumes, Xfce pops up some system information. Notice the crisp font display after the application of the rendering hack. I did wonder if the 1GB of RAM would significantly hamper performance, but I'm pleased to report that overall performance was good. In fact, it felt faster than the Windows XP that came with the machine. One thing that annoys me about performance under Windows is that it tends to be inconsistent. For example, things often felt slow following a recovery from a suspend or hibernation with XP, requiring a reboot to get back up to speed. Web browsing, in particular, seemed more consistent, in performance terms, than it had under Windows XP, in all but two areas. For some reason the Google Docs word processor doesn't seem quite as fast as it did when run in Firefox under XP, sometimes struggling to keep up with my typing. I may get to the bottom of this, in time, and it's not a huge problem. Another disappointment (although an expected one) is the performance of Flash under Linux. Under Windows XP, this machine shows almost no extra CPU usage when switching YouTube videos to full screen 480p. However, due to the sub-optimal performance of Flash on Linux, I couldn't even get smooth playback of 320p in full screen mode under Linux. In windowed mode, the performance was acceptable, and there is a partial work-around in the form of FlashVideoReplacer. Sure enough, after a reboot, I was able to browse the network from within Thunar. Incidentally, I also installed Xubuntu onto a memory stick for another little project. It ran well with this configuration. I'm a Linux lover rather than a Windows hater, and my overall assessment was that Xubuntu 11.10 was a better fit than Windows XP on this netbook. Being fair, one has to remember that XP is now ten years old. Xfce is going to get better and better, and it's already very comprehensive. There is a growing contingent of users for whom the direction that KDE4 and Gnome 3 have taken doesn't ring true, and increasingly, Xfce is going to be the first choice for them. If you want to put together a netbook system that looks similar to Gnome 2, is designed to run well in a slightly resource constrained environment and yet potentially offers a full Ubuntu system under the hood, I'd highly recommend Xubuntu 11.10.